Talia, of ConduitPress, made this book for our book swap. 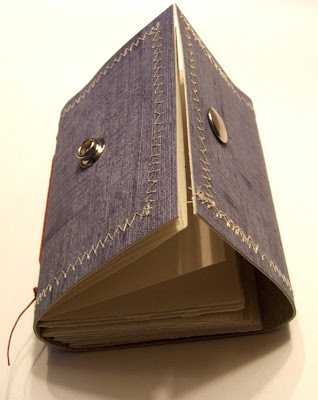 Talia said she used "upcycled vinyl wall covering remnants for the cover of this long-stitch bound book. Two different pieces of the fabric backed vinyl wallcovering are glued together using PVA and then sewn using the zigzag stitch for both decoration and reinforcement. There's a beautiful blue on one side and a muted beige on the other. I Love the way it wraps around and sort of looks like a tiny little wallet- a great little book for note-taking on the go. 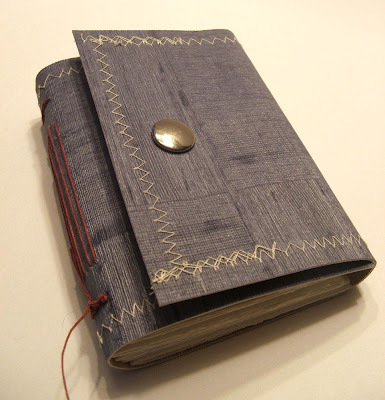 I used a sturdy snap button to close the book and red linen thread for its binding." Visit ConduitPress.Etsy.com to find more of her books. This swap has produced a real burst of great books, one nice than the other. - This is another beautiful example. I like how it looks like a wallet on first sight.